At last - the storage solution you have been waiting for! 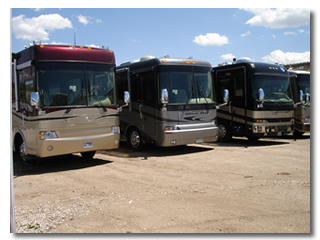 Store your motorhome, fifth wheel, camper, boat, watercraft and trailer all at one convenient location! With several acres of storage, our rates are the most reasonable in the Denver Metro area at $1.75 per foot. Sign up for ONE YEAR and get ONE MONTH FREE! We require a minimum of three months contract for storage.